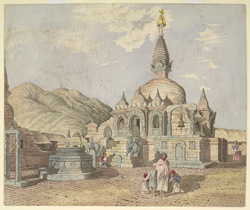 Watercolour of the temple of Chillandeo at Kirtipur in Nepal, by Henry Ambrose Oldfield (1822-1871), dated March 1854. The image is inscribed on the reverse: 'Buddhist Temple, called 'Chillundeo' nr Kirtipore. March 1854'. Dr Oldfield, who was Residency Surgeon at Kathmandu from 1850-1863, wrote in 'Sketches from Nipal, Historical and Descriptive...' (1880), "Kirtipur is raised between two hundred and three hundred feet above the level of the surrounding plain. It overlooks the city of Kathmandu on the north, and that of Patan towards the east, from each of which capitals it is distant about three miles...Kirtipur has never been an extensive city; but its almost impregnable position gave it an importance, disproportionate to its size, during the early period of Nipal history...In the south-eastern quarter of the city there is a Buddhist temple, called Chillandeo, which, though comparatively small, yet on account of the number of sculptured objects of Buddhist worship which it exhibits, and the accuracy with which the various deities and their respective symbols and vehicles are figured, is one of the most perfect and valuable monuments of Buddhism in the whole valley."